This has been perhaps the years most highly touted grindcore release. 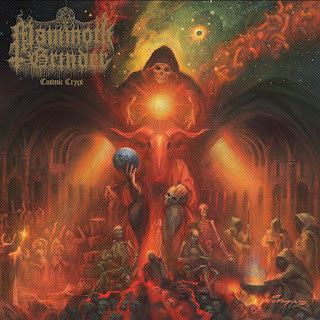 It's been five years after all, and this latest offering from Mammoth Grinder, Cosmic Crypt is the sort of punishing deathgrind that you can't help but to fall in love with. Utterly terrifying, over the top and ready to destroy you at any given point there is something incredibly addictive, almost magical about what Mammoth Grinder has done here. The monolithic punishment of Cosmic Crypt is terrifying and hints at far darker worlds to come. The sheer amount of riffs that dominate this record is stunning, yet it's surprisingly tastefully done. I feel like on most death metal releases in this day and age it's easy to find tracks that suffer in terms of songwriting. Here though we find that Mammoth Grinder is giving you riff salad, but also couching it in some of the finest songwriting that I have heard in the genre for a good long time. It means that Cosmic Crypt is something that will make you want to mosh all day, but which will guide you into deeper and darker sonic blasphemies with every passing moment. the sheer insanity of this release drags you in and will refuse to spit you out. Chock to the brim as it is with short tracks (Not a single song of the eleven clears the four minute mark and most don't even touch three) this is an addictive listen. A record that pushes forward with a sort of innate hatred and inborn devilishness that only the true greats can emulate, Cosmic Crypt will leave you dragging your jaw off the floor. It's rare, I think, that you get to listen to an absolute monster of a release like this one, but right now I have to wonder what's in the water in Austin, because this borders on perfection.